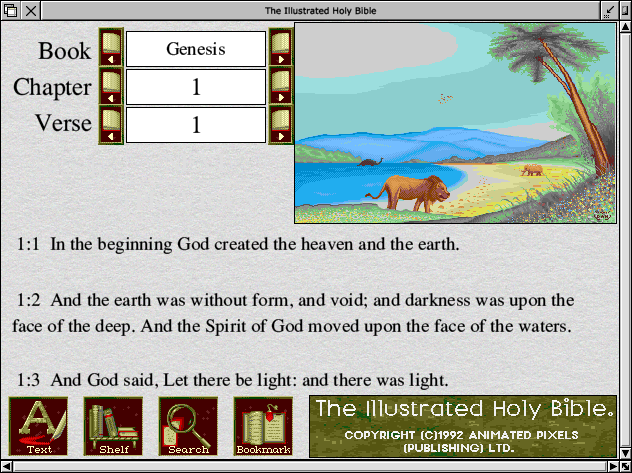 The Illustrated Holy Bible on CD rom. This application was originally by written myself for Cumana to bundle with A5000 computers to schools. A number of people still find it useful, even on much more modern systems, so I updated it to work with newer font managers and RISC OS 4/5, including Select. For those of you who don't have the original CD Rom (which I believe is no longer available, even from thee who hath it in stock), you can download the full data for the King James Edition, complete with illustrations. This is 5MB long as a ZIP file and extracts to approx 10.6MB. Download: BibleData.zip [5M], downloaded 407 times. - Showing installation location and 'config' file, pointing to datapath. JPEG image to conserve download speed - apologies for quality. 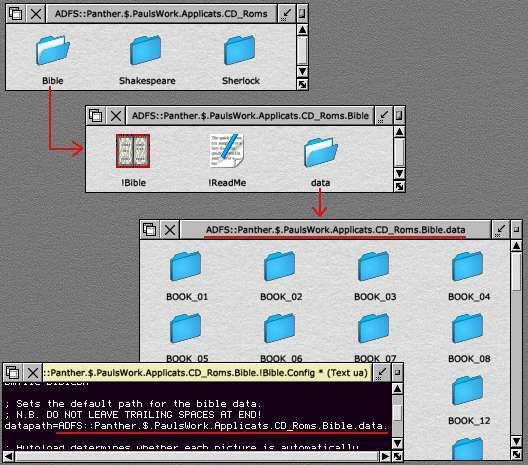 If you find !Bible useful, you may be interested in The Illustrated Works of Shakespeare or Sherlock Holmes, which are also available as RISC OS multi-media applications. Extended menu buffer to cater for longer font lists and added additional debug information in case of errors. Enabled hourglass whilst scanning CD drives. Prevented config file being left open in case of error. Fixed bug in 'search' routine which resulted in no matches. Fixed bug in selecting book, which sometimes resulted in the wrong book. Miscellaneous minor bug fixes and tidy-ups. A 'Quote' option from the main menu will let you quote the current verse at the caret position. This is useful if you wish to quote a particular verse into a text editor, word processor or email package. Additionally, if you hold SHIFT down, a label will also be added. Chapter & Verse navigation icons now auto repeat for rapid navigation. Chapter & Verse navigation icons reverse action if ADJUST clicked. Cursor up/down now recognised in Chapter & Verse navigation icons. Stopped the caret being turned off under certain circumstances. Improved error handling during initialisation stage to prevent 'recursive' errors from hanging the machine. Tidied search routine up a bit. Although powerful in it's day, it never really got updated inline with developments in the RISC OS world - until now that is. I have now revamped the entire application and tested it with RISC OS 4, fixing a number of bugs in the process. This version fixes the 'not enough space for fonts' bug as well as incorporating some new features not in the original.